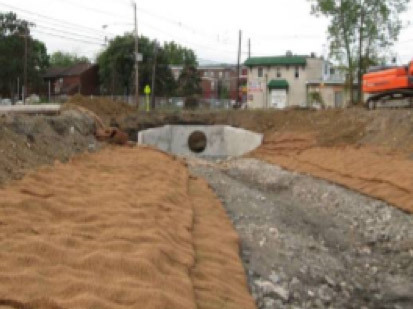 The City of Trenton, as part of a larger urban revitalization and brownfield redevelopment project, decided to integrate into the project’s overall design the restoration of a segment of Petty’s Run that had been routed into a pipe. The city had taken ownership of the former Magic Marker factory site and other properties adjacent to the stream to build affordable housing and create urban green space. Over the years, Petty’s Run had suffered a variety of impacts common to urban streams. The daylighting of the stream not only added to the environmental and aesthetic setting of the development, it also eliminated a significant flooding problem by removing a narrow road crossing, re-creating a functioning floodplain and riparian area, and re-connecting 250 feet of piped stream channel with the floodplain. 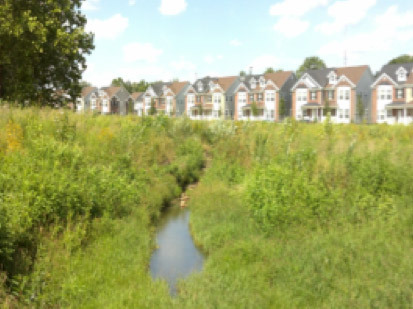 The resulting green-infrastructure stormwater management design addressed a range of issues including the restoration of many of the natural functions associated with this stream. Heavy debris and the concrete remains of earlier development were removed from the channel. The upstream road crossing was removed and replaced with a pedestrian crossing. Channel dimensions were designed to accommodate higher flows and the 250-foot piped section was daylighted. Associated with this work was the creation of an adjacent floodplain meadow. At the downstream end of the project, a new headwall and larger pipe were constructed to connect to the existing downstream drainage network. 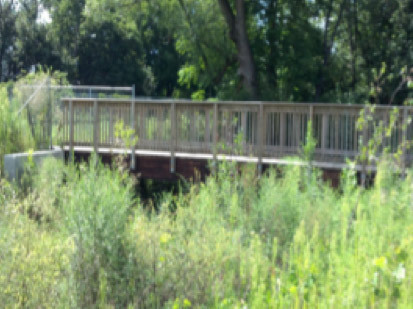 While adding habitat value, the area serves as aesthetic public open space with a walking trail linked to the nearby neighborhood. The project won a 2011 Phoenix Award for Brownfield Redevelopment and a 2013 Bowman’s Hill Land Ethics Award.